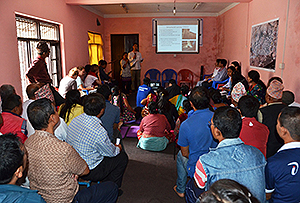 Under the above-mentioned support project through the Networking Core Centers for International Cooperation on the Conservation of Cultural Heritage Project commissioned by the Agency for Cultural Affairs, we continued to dispatch staff to the site in Nepal. This time (August 31st through September 11th, 2016), we sent four members including outside experts. As part of this project, we conducted investigation activities at the village of Khokana, which is on the Tentative List of World Heritage Sites, so as to examine how to rehabilitate damaged historical villages. 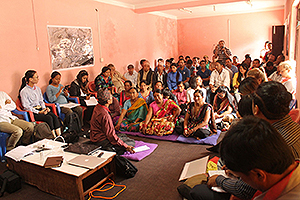 In Khokana, many residents are forced to live in temporary housing. How to balance early reconstruction with the conservation of historical streetscapes is a challenge in rehabilitation. As one of the main activities in this dispatch, we organized a debriefing session for local residents to explain the outcome of our last year’s investigation. The session was attended by more than 100 residents with greater interest, who asked questions and expressed their opinions after the presentation. They were highly suggestive for us in considering how we should conduct a further investigation or make contributions to them. Our investigation revealed that not only Khokana but the whole country lacks sufficient systems to preserve historical villages, which results in preventing the passion of citizens from promoting the conservation of their streetscapes. Japan, which had not conserved historical villages thoroughly in the past, established its legal system through a process of trial and error for the protection of historical villages and landscapes, including the system for the Preservation District for Groups of Historic Buildings. Referring to this experience in Japan, we will continue to provide technical support for local institutions to contribute to the conservation of historical villages in Nepal.